For the men who served in America's Amphibious Forces during World War II, the conflict was an unceasing series of D-Days. They were responsible for putting men ashore in more than 200 landings throughout the conflict, most against well-entrenched enemy positions. 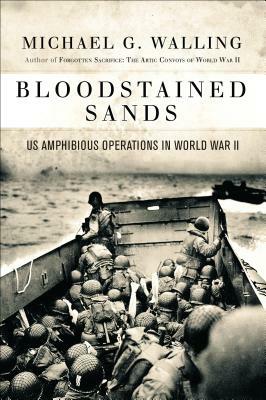 Bloodstained Sands: US Amphibious Operations in World War II tells the story of these forgotten men for the first time, tracing their operational history from Guadalcanal to Casablanca, Sicily, Normandy, Iwo Jima, and finally Okinawa. The men's stories are told in their own voices, with fascinating accounts from Underwater Demolition Teams, Attack Transport crews, and many other unsung heroes of World War II. First-hand interviews, entries from personal diaries, and Action Reports create a unique history, perfectly complemented by historic illustrations and detailed maps. These are timeless tales of determination, sacrifice, and triumph of the human spirit--tales of US Amphibious Forces that for too long have gone forgotten and untold. Michael G. Walling is author of several books, including Bloodstained Sea, winner of the 2005 Samuel Eliot Morison Award for Naval Literature. Walling is a contributing author to the US Naval Institute's Naval History magazine and has appeared on The History Channel and PBS. Walling served in the US Coast Guard for six years as a commissioned officer and a senior petty officer. He has spent more than 45 years collecting stories from veterans from World War II, Korea, Viet Nam, and Iraq.